Just a couple of reviews for you this week, beginning with the K: Missing Kings movie. K was an odd series for me, a case of being put off by the delivery, first with its online streaming coming through the intermittent Anime on Demand service, and then its first series being released in the UK by Kazé, a company that never listened to feedback on the poor quality of their disc authoring. When those review discs turned up, I passed them on to Stuart McLean, who gave the show a fair to middling review. But that wasn’t the end of the K story, as it garnered a second series, and a film to bridge the two as well. This time it’s All the Anime releasing the discs in the UK, and I’m beginning to have second thoughts about shunning the show, especially after reading Stuart’s review of the feature film, another trip to the future world of cyberpunk gang warfare. Next it was my bite at the All the Anime Cherry, as I took a look at Amanchu – Collector’s Edition. Well, technically I looked at a couple of check discs, so opinion about the Collector’s bit won’t be forthcoming. But as for the slice of life show, the gentle comedy about an introverted girl transferring to a school in a coastal town, and being befriended by a quirky girl who wants to share her love of scuba diving; Amanchu is one of the good ones. It really does have its heart in the right place, and you can just let your cares be eased by spending 25 minutes in its company. Click on the review to read more. 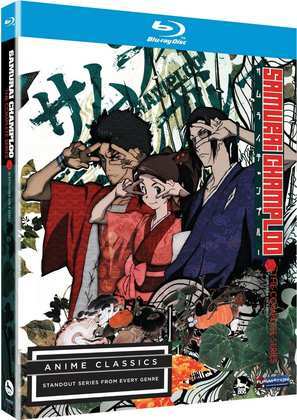 Samurai Champloo. I’ve been revisiting quite a few shows that got me into anime in the first place, shows that I thought were classics at the time, but which haven’t worn the years well. Samurai Champloo isn’t one of those shows. After all, it’s a Shinichiro Watanabe joint, a show from the director of Cowboy Bebop and Kids on the Slope. And while he didn’t team up with Yoko Kanno on this one, his collaboration with the late Japanese hip-hop producer Nujabes created a singular music experience for this mixed up smorgasbord of a show. It’s a road movie at its heart, a girl who enlists the reluctant aid of two itinerant samurai goes looking for her father, travelling across Edo era Japan, and getting into all manner of crazy adventures, not limited to baseball and zombies. MVM released the show on DVD in the UK in 2005, seven single volumes followed by a complete series collection. But like all classic anime, it got revisited for HD, and Funimation in the US, who had picked up Geneon’s licence when they shut down, gave it a Blu-ray release, which kind of sucked. It was so bad that they had a second go, which they released on the Anime Classics label, which undid all the DNR that ruined the first try. The second release was also Region AB, so I was quick to import it. Here’s my review. A little too quick it turns out, as MVM released that Blu-ray as well, not long after I had bought the US release, and you can still buy MVM’s Blu-ray today. 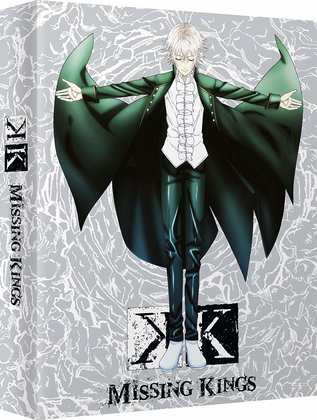 All the Anime released K: Missing Kings on combo Collector’s Edition, and standard DVD on October 15th. They also released Amanchu on Collector’s Edition Blu-ray on October 29th.